Open innovation has gained popularity in recent years. But is the concept new or does it express old realities? 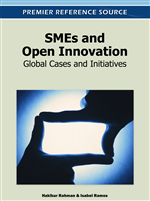 The literature review of this case study found that the term “open innovation” is recent and that its development has been facilitated by technological innovations. The case study collected data over a period of eight months from an agrifood SME in Quebec, Canada. The aim was to go beyond the basic model of open innovation and integrate dynamic, absorptive and appropriative capacities into a new working open innovation model. Initial results show that components associated with the basic open innovation model such as intellectual property, joint R&D and co-product development are present as well as certain organizational capacities. The difficulty of applying the concept is due to its interactions rather than its components taken individually. The study concludes that further work is needed to extend the applicability and the foundations of open innovation. The current literature on open innovation provides little theoretical structuring (Van de Vrande et al., 2010). It first focuses on describing the contexts which show how some companies like IBM, Xerox and others1 were able to make a comeback at a crucial point in their history (Chesbrough, 2003) in the United States. Then, the literature has moved forward to Europe (Lazzarotti, Manzini & Pellegrini, 2010; Lichtenthaler, 2008; Stoyanov, 2008) and other places around the world. Authors such as Chesbrough et al. (2006) have called open innovation a “new paradigm” as they have tried to define the economic realities associated with it. But open innovation itself remains as a question, what is it?